WORKS minister John Mutorwa is concerned over unnecessary delays in implementing national road projects, including tenders worth more than N$1,4 billion. 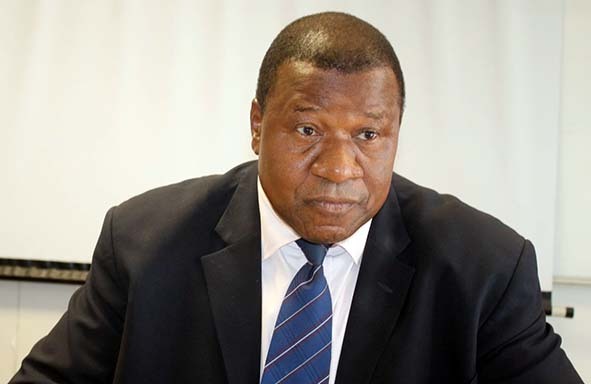 Mutorwa told the Roads Authority (RA) in a letter sent to chief executive Conrad Lutombi on 14 February 2019 to avoid bureaucratic bottlenecks that were delaying the implementation of road projects. He was responding to Lutombi's letter sent on 14 February 2019, in which the RA CEO explained the issues that are delaying the implementation of two prioritised road projects under the Harambee Prosperity Plan. The projects in question include the last phase of the Windhoek-Okahandja road, which is 21 kilometres and requires N$1 billion, and the last eight-kilometre part of the Swakopmund-Walvis Bay road that needs N$435 million to complete. In the letter, Lutombi said the two tenders for these projects were not advertised because they had asked the ministry to exempt the two projects from the “general government moratorium, which stipulates that no new government project should be commenced without the necessary approval”. Only after that permission was granted would the tenders be advertised for bids, as per the Public Procurement Act, he said. When approached for clarity on Monday, Lutombi said they requested permission to start the new projects to avoid perceptions that they were doing things under the carpet. He said the two projects will thus be advertised after they get permission. In his letter, Mutorwa said he is expected to report to Cabinet on progress made on road projects in all 14 regions, based not only on “glossy narrative reports, but concretely and visibly indicating the actual projects that were successfully and practically implemented”. The minister said on Monday that the moratorium referred to by Lutombi does not exist, hence his advice to the RA to avoid unnecessary delays. “I don't even know what you are talking about. This issue was discussed on Friday [last week], and I advised them as per my notes on the letter that was sent to them,” he stated. The Namibian reported last year that the RA wanted to give the contractors on site extensions to work on the extra kilometres to avoid advertising the tenders. Lutombi at the time argued that the projects would be delayed, and it would cost the government more money if the contracts are re-advertised. According to him, extending the contracts of the companies currently on site would be cheaper, and save up to N$251 million. This move was, however, blocked by the Central Procurement Board, which ordered the parastatal to advertise the tenders. Works executive director Willem Goeiemann yesterday said although proposals were submitted to the government on how to handle the new tenders for these projects, a final decision was yet to be made. He said the ministry was still busy with consultations, which include options on whether or not to advertise the new tenders. The spokesperson of the works ministry, Julius Ngweda, confirmed to The Namibian that the parties were still divided on this matter, but the ministry wants the tenders to be advertised. “They (RA) wanted to proceed with the companies already on site. But when we looked at the amount, we saw that it would not work, and it would also not be in compliance with the Procurement Act. “The ministry wants the tenders to be advertised because there are people who wanted things to be done under the carpet. The current minister wants things to be done procedurally,” he stated.